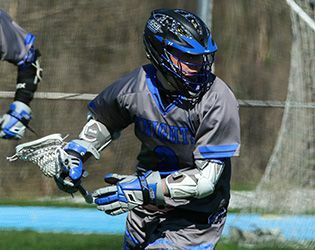 Yesterday, both the boys’ and girls’ varsity lacrosse teams posted wins in their season openers. At home, the boys defeated Parsippany Hills 12-3. Senior Nick Cooper dominated the scoring with seven goals—enough to push the attackman past the 100-goal mark with Gill—and two assists. He is the first player in GSB history to hit that milestone. Senior Cameron Burns contributed three goals and three assists, senior Lake Jacobson added a goal, and sophomore Jake Panza recorded his first goal with the varsity squad. In addition to a powerful offense, the team relied on senior goalie Will Dadouris, who made a phenomenal 19 saves to help the Knights to a decisive victory. On Tuesday, April 4, the boys will play Morris Catholic on the road. On the road, the girls' team bested Stuart Country Day School 12-9. Leading the scoring were sophomore Andree Aloise and freshman Lauren Garcia with four goals each, followed by senior Emma Dean with three. Freshman Lexi Yates added a goal as well. In the net, junior Katherine Lioudis made 12 saves. On Saturday, the girls will face Delaware Valley Regional at home. A great start to the season—Go Knights!